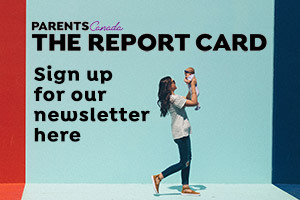 Life with kids in car seats makes things complicated when it comes to school pick-ups, after school programs and weekend play dates. But truthfully, safety always comes first. You will never see my kids in the wrong car seat for their height and weight, and they will never go in someone else’s car who does not have the right seat for them. 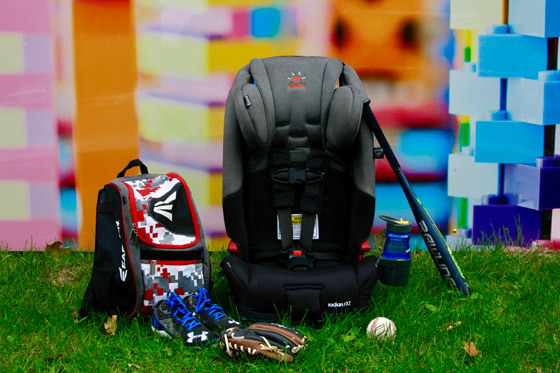 Car seats can take up a lot of room and leave little space for anything else in the car, but kids are precious cargo. Nothing can be more important than that! When it comes to driving kids around, I am at the top of everyone’s list. (Excuse me while I blush!) I have become the mom who everyone calls when they are in a bind and need their child driven home from school or they are out of town and need a ride for their kids to extra-curricular activities or a birthday party. I might have 2 kids, but at any given time I have 3 or 4 car seats in my car. People often ask me how many car seats I have all together and the answer is a lot! All the kids know I like to joke that my car is the neighbourhood school bus, because I always have a few extra kids in my car! 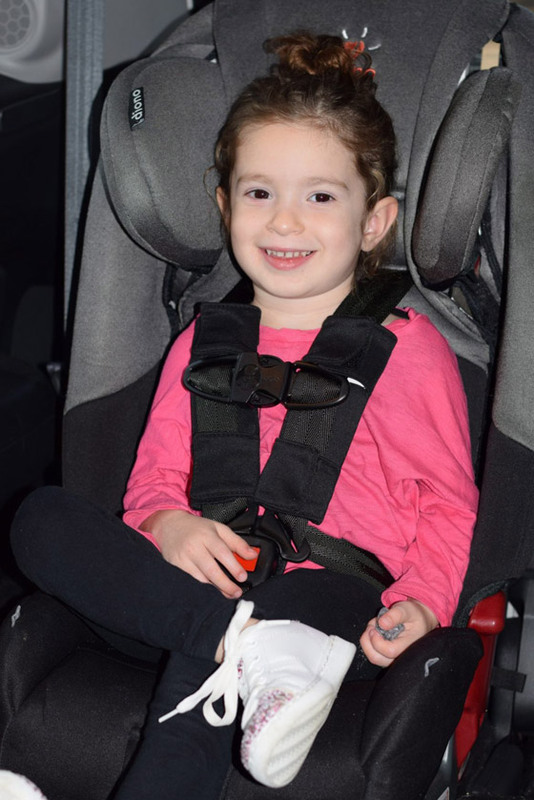 Over the years, I have done a lot of research on car seats in order to choose which seat fits my needs best. 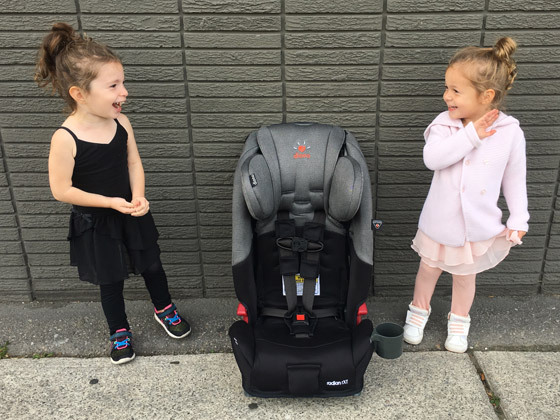 As the kids are getting bigger — and so are their friends — I have come to rely on the Diono radian rXT. 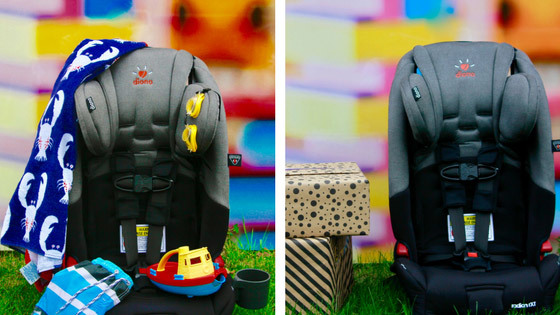 While my first thought was, “Wow this car seat is heavy,” my very quick second thought was, “What could be safer than a car seat made out of a steel frame?” For my own kids, I know I am making the best choice for them when I purchase their car seats, but it is important to me that other parents know I take their child’s safety just as seriously as I do my own. When I tell them that I have Diono carseats in my car, I can see the comfort in their eyes. However, having the car seat is not enough. I always ensure the harness is at the right height for the child in the seat. In addition, I have added the Safe Stop Harness to the back of the seat since the kids in my car are now all over 22 pounds. I always give attention to the adjustable head support to ensure it is in the correct position and that the buckle is at the correct armpit position to ensure their safety. With a bench in the middle of the car, I love that I can fit three Diono carseats across the row. I hate saying no to adding more kids to the bunch whether we are off to the park or a party. So it’s important that Diono allows me to utilize all of the seats in my car. While safety is number one in my book, convenience ranks pretty high as well! The installation is just as convenient and easy with the unique SuperLATCH (UAS) system. When I don’t need the seat installed, it folds flat and takes up minimal space in my trunk so I can run to IKEA and put the seats down to get all my purchases in the trunk! I can promise you, if you need me to take your kid somewhere, they will be in the safest car seat in my car!